Well, it is Tuesday again and I am writing this here post. Turns out that today the wife is out of town in Boston and the youngest kid is in ill and I am at home with the sickun. She is sniffly and congested with a very low grade fever. No biggie. She is chomping on some BBQ potato chips and drinking some OJ. I am quite the parent. In my defense the chips are kettle cooked. Today’s topic is Gifting. Thanks this week go to Lord Pithy, Dr B Dawg, Nadolny, and Some Other Guy. Onto the questions! 1. When your spouse says something like, “Let’s not give each other gifts this year. We already have so much.” How do you proceed? Is it better to disappoint or disobey? I have made the mistake of not getting something “not on the list” for my wife, even when she said “Don’t worry about getting anything not on the list.” I will always get a gift now, no matter what the fool woman says. 2. Put you and wifey in O Henry’s ”Gift of the Magi.” What would be your watch and her hair? Hmmm… I have never thought of this one… I guess I would have to sell some art supplies so that I could get her some vacation, and she would have to work through her vacation to get me some Bristol board. 3. Would you rather receive toe socks or a pedi-egg? Toe socks… my feet are amazingly smooth and silky already. 4. If Santa owed you a favor, what would you ask for? I would ask for a ride on the sleigh… that sounds rather dirty. 5. Have you ever laughed at a gift, only to find it wasn’t meant to be a joke? Describe. Well, my grandmother on my dad’s side always gives such inappropriate gifts and my parent’s are known for the “not-so-great” gifts. 6. Is there such a thing as a bad wrapped gift? A badly wrapped gift? Or are you meaning a crap gift that has been wrapped? Both are easily possible. 7. Are you a gift shaker? Not since I was about 10. You know, as long as they bring the same total happiness, it doesn’t matter…. but they better bring me happiness, or there will be Hell to pay! A quilted plastic Santa decoration door hanger. It was Hawesome!! 10. Are you a re-gifter? Very rarely, and typically only if we received a gift that is really high quality of something we just won’t use. Think waffle iron. 11. 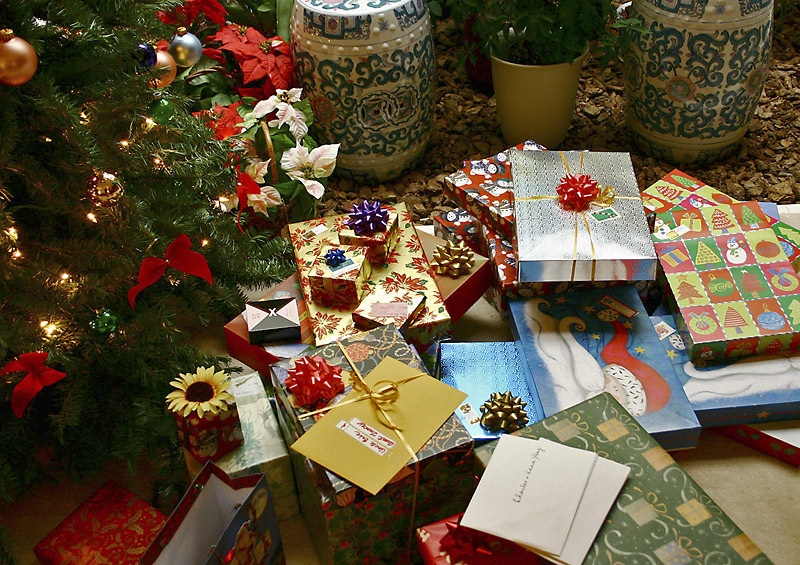 Where do you fall on re-gifting? As stated previously, as long as one is not re-gifting just to get rid of crap, is not necessarily a bad thing. It becomes a bad thing when the re-gift is not thoughtful or the quality of the gift is crappy. 12. Ever re-gift something where the person who originally gave it to you found out? 13. Worst gift ever received? (OK, everyone asked that I’m sure). A cheap green vinyl tablecloth that reeked of tobacco pipe smoke. The Looney Tunes Chess set… it was a back handed gift though, but that is a story for a different time. 15. If the great gift is giving, why are we being so selfish and sticking it to all these folk who must live with the second greatest gift (known as receiving). Aren’t we just damn selfish to be thrusting gifts upon our poor and unsuspecting friends. I look at it as giving the gift of allowing them to give to me. I am just giving in that way. 16. How many real gifts do the kiddies get? Hmmm… a pretty good amount. From Mama and Papa? About 5 a piece, if I am remembering the lists correctly. 17. Does Wifey have something particular on her list this year that you aren’t able to procure? Well, she is wanting an iPad 2, but we cannot spring for that cost at the moment. Maybe for Valentine’s Day, babe, maybe for Valentine’s Day. 18. What does Little Man want that he is just not getting this year? Well, unless his uncle who is stationed in Germany comes through like a super-hero, either the LEGO Star Wars Super Star Destroyer or the Death Star. Those both come in at $499.99 US. No can do. Wifey ain’t getting an iPad 2, and Little Man ain’t getting the Death Star. 19. What is on your list that you aren’t getting? Well, I was hoping to have a new job by Christmas, but that is not happening. Maybe by MLK Day 2012… keep your fingers crossed. 20. Are you done with your Christmas shopping for all your gifts, this year? Nope… In fact, I am off to Amazon.